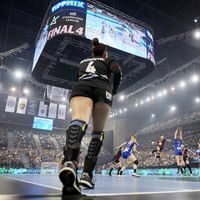 Ticket sales for the WOMEN’S EHF FINAL4 2018 have started on Saturday, with the official launch happening at half-time of the match between title holders, Győri Audi ETO KC, and FC Midtjylland. Fans wishing to be part of next year's showpiece event are advised to be quick, as an early-bird discount applies for the first two weeks. The Women's EHF FINAL4 2018 will take place on 12/13 May 2018 in the Papp László Budapest Sportaréna in front of a maximum capacity of 12,000 spectators. It is the fifth consecutive EHF FINAL4 event that will be staged in Hungary's capital. Following the end of the early-bird discount phase new ticket prices for the Women's EHF FINAL4 will come into effect. For four years in a row, the WOMEN'S EHF FINAL4 has been showcasing the very best of women's handball. The 2017 edition saw Hungarian powerhouse Györi Audi ETO KC lifting the trophy following a thrilling final including extra time (31:30) against Vardar from FYR Macedonia. 2016 winners CSM Bucuresti took third place after a 26:20 win against Buducnost. To date, three different teams have won the WOMEN'S EHF FINAL4. Györ took first place in the inaugural 2014 edition as well as in 2017. Buducnost from Montenegro won in 2015; CSM Bucuresti in 2016.